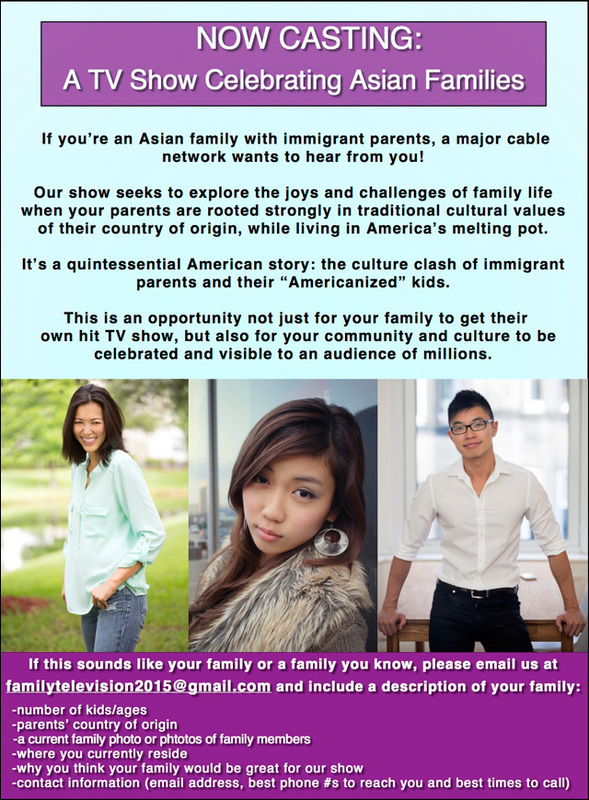 Major cable network seeks Asian immigrant parents and their "Americanized" kids for docu-series. I don't know if it's the success of Fresh Off The Boat or Crazy Rich Asians or what, but there's been a recent spate of casting calls looking for Asian American-themed reality television shows. Here's another one. GRB Entertainment, a production company that specializes in unscripted alternative programming, is looking to cast subjects for a "docu-series celebrating Asian American families" on a major cable network. They're very interested in finding an Asian family with immigrants parents and first generation children born in the United States, to explore the culture clash of traditional old-world parents and their "Americanized" kids. Does that situation sound familiar to you? Does your family wanna be on TV? If you’re an Asian family with immigrant parents and first generation children born in the US, a major cable network wants to hear from you! Our show seeks to explore the joys and challenges of family life when the parents are rooted strongly in the traditional cultural values of their country of origin, but the kids are fully “Americanized”. It’s a quintessential American story: the culture clash of immigrant parents and their “Americanized” kids. Everyone can relate to this experience but we believe that Asians have been woefully underrepresented in television and that your stories have not been told. We want to change that! This is an opportunity not just for your family to get their own hit TV show, but also for your community and culture to be celebrated and visible to an audience of millions. **If possible, please include at least one current photo of your family (but feel free to send as many as you like). As I've said before, from pawn shops to truckers to really awful rich people, you can make a reality show about damn pretty much anything. So why not an Asian American family? For better or for worse. So, if you're interested in getting some cameras all up in your family's business for America to see, here's your chance. Reality television glory beckons.